The Cooperative Purchasing Connection is now partnering with the National Joint Powers Alliance (NJPA) to bring you more opportunities to save time and money using our competitively solicited contracts. The new CPC Contract Catalog and the new NJPA catalog are available at www.purchasingconnection.org or by clicking on the images. 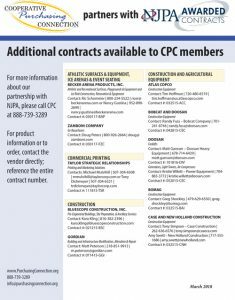 As CPC participants, you now have access to an even wider range of contracts for supplies, athletics, facilities, construction, vehicles, elevators, ice rinks, landscaping, fitness equipment and more. To ensure you are receiving discounted pricing when using the contracts, call or email the contact listed and always remember to ask for the Contract #. 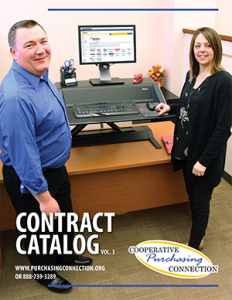 The Cooperative Purchasing Connection (CPC), a multi-region purchasing program of eight service cooperatives, has partnered with NJPA’s national purchasing program to offer a large selection of NJPA contracts to our members. CPC and NJPA worked together to select contracts that complement and expand the CPC solicited contracts. NJPA chose CPC contracts to add to their offerings in Region 5. The service cooperatives are excited to be combining our national and regional expertise to provide members with more buying power and more choice when purchasing. Plus, all of the contracts have been awarded through the required competitive process. Call us at 888-739-3289 for more information.